In January 2005 The Guild received an email from Hugh ("Hubie") MacDermott. 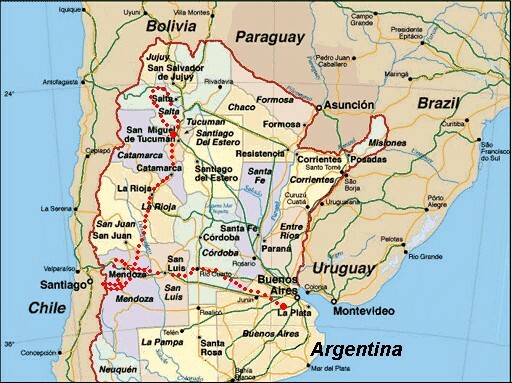 I'm currently preparing for a ride from Argentina to Ecuador. In between preparing for the trip I am living and working on a ranch about two hours from Buenos Aires. 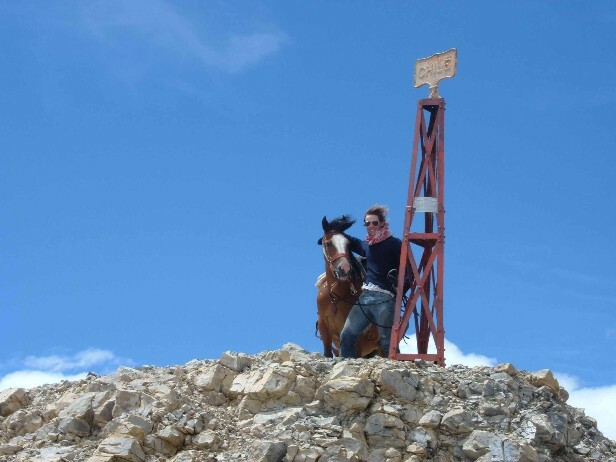 At the moment I´m in the process of buying the two horses I am going to use for the trip at the moment. One is a pure Criollo and the other is an Arab/Criollo cross. I found your website wonderfully helpful and I´d love to hear any more advice you can give me. Thank you for those kind words, Hubie! Please click here to read Hubie's earlier messages. Just thought I'd drop you line with a few photos. I am now resting the horses for a few days before I head into Tucuman province, known as the garden of Argentina. So should be a bit more chilled than the last part. Where San Juan, San Luis and Mendoza provinces meet is roughly the centre of the desert lands of Argentina. I rode into them with the same blind ignorance as I've gone through this whole trip, (really it is tribute to the kindness and generosity of the Argentines I've got this far) and soon found it wasn't much fun travelling during the day, actually it wasn't much fun at night either but easier at least. Once in San Juan I was lucking enough to met a guy who offered to guide me cross country through the worst part. It was fascinating not least for the people who live there. I just couldn't work out why after travelling thousands of miles from the old country an immigrant would decide not to settle in one of the many grassy parts of Argentina but in the desert. However they were no different than the rest of Argentines and we were received with open arms wherever we went. Which was lucky as Eusebio my guide, despite being a very nice chap, didn't know the country quite as well as he said he did. We got lost twice and without the help of the locals I doubt we'd have got through. He stayed with me for a few days on the road before heading home and I was very sorry to say goodbye to his jolly company (and his skill at catching quirquinchos, mini armadillos). On my own again I set off for la Rioja province, bizarrely it is a little greener but even hotter. The sun was hitting forty degrees by nine o'clock and it was a killer getting through but I was told I was lucky as the month before it had been over fifty. 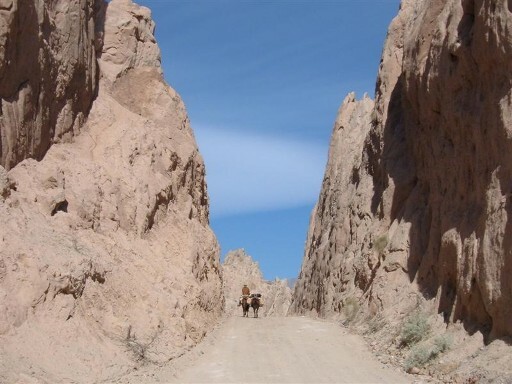 After a brief stay with the mounted police (who interestingly use lassos, long whips and pump action shot guns to control the Riojano rabble) in the city of La Rioja I headed into the wonderfully green and hilly province of Catamarca. Other then having a bit of a scare by some vigilante farmers, who took me for a horse thief and questioned me at gun point, it was a lovely ride and I am now relaxing at an out of season holiday resort. Well that’s about it I'm now going to head up to Salta province before cutting across south east to Formosa province where I'll meet my brother and this time we'll definitely ride together for a couple of months. P.S I've now gone over two thousand kilometres which must be about fifteen hundred miles. Congratulations, Hugh! Welcome to The Guild! Click on any of the photographs below to enlarge it. Eusebio and me at his home in the oasis of Encon. The huge white sack on Cocca's back is a very light-weight feed. Me riding through the desert. A quirquincho ready for cooking. Eusebio riding through the desert. My photogenic team of horses posing in our current very green surroundings.